As free agency gets set to officially open, the Ottawa Senators made the first big splash of the day. Jason Spezza has been dealt to Dallas for Alex Chiasson, Alex Guptill and Nick Paul and a second round pick in 2015. UPDATE: Dallas has also signed backup goaltender Anders Lindback and forward Ales Hemsky. Chaisson, 23, played 79 games for the Stars last season and had 13 goals and 22 assists. Guptill, 22, is listed at 6-3, 180 and had 25 points (12 goals, 13 assists) in 31 games in his third season at the University of Michigan last year. He contributed two assists in five regular season games with the Texas Stars last season. Guptill was a third round pick of the Stars in 2010. Paul, 19, was a fourth round pick by Dallas in 2011. Listed at 6-2, 202, Paul had 26 goals and 20 assists in 67 games with North Bay in the OHL last season. I expect somethink like…………we are happy with our group of players……. Price for Spezza was to high…………. Price for Spezza wasn’t too high, it was wrong. Hawks don’t have cap space to send 3 prospects + a pick to OTT for him. Needed to move a more significant asset to make him fit. What Dallas gave up wouldn’t have worked in Chicago without other moves happening before/soon after. Maybe we could pick up Moore or Richards? Anaheim and Dallas have made meaningful improvements. LA will remain formidable. St. Louis is talented and very deep, and God save the queen if they sign Statsny. Minnesota has become a serious team too. The only team of note in the Western Conference that may go backwards is Colorado. I’m a bit depressed. And I’ll say this again, Perreault would not be a good fit. Still say also that Leddy gets traded. I know many of you would love to see the #Blackhawks respond to these moves in West. But fact is, these moves ARE the responses to CHI, LA. Let me translate – Blackhawks will not get second line center and they have an excuse. Spezza was never gonna happen without sending Sharp and Oduya out. That is just much horsepower for the Hawks to give up for him. St Louis can afford Statsny but they have a few holes to fill too. IMO the Hawks need TT to be ready next season. Its time. Move the prospects up. I hope Hawks fans don’t fall to sleep and think the Hawks don’t need help? 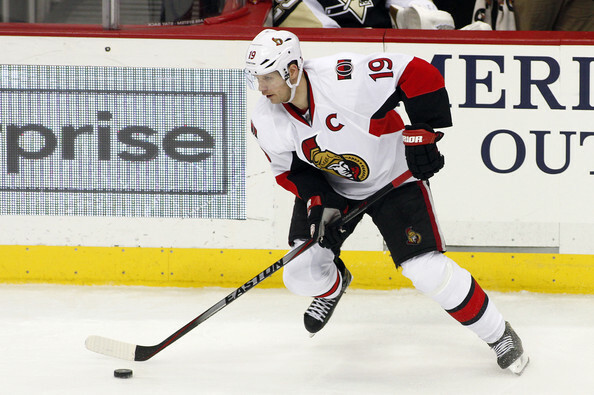 Spezza would be a good fit and solid center. It’s an obvious weak spot for Hawks, not many wins this year in playoffs when we needed the face-off, in fact it’s a big reason we lost and literally almost lost every series. Our Defenses needs a life too, too many turnovers, and teams dump, wait and play our man, pretty simple formula. I hope the Hawks make a big deal, Iginla is the last hope but BOSTON is way to smart to deal this guy too good, tuff, and has the fire to win a cup, DESIRE is big, winning 2 sort of takes the pressure off. not good, stir it up! As we al know the entire WEST is getting better this is prime time. ← NHL Free Agency: Mathieu Perreault, Blackhawks A Fit?